The jhesiri and the hilljacks are a couple groups of teratic goblins in a campaign I am working on. 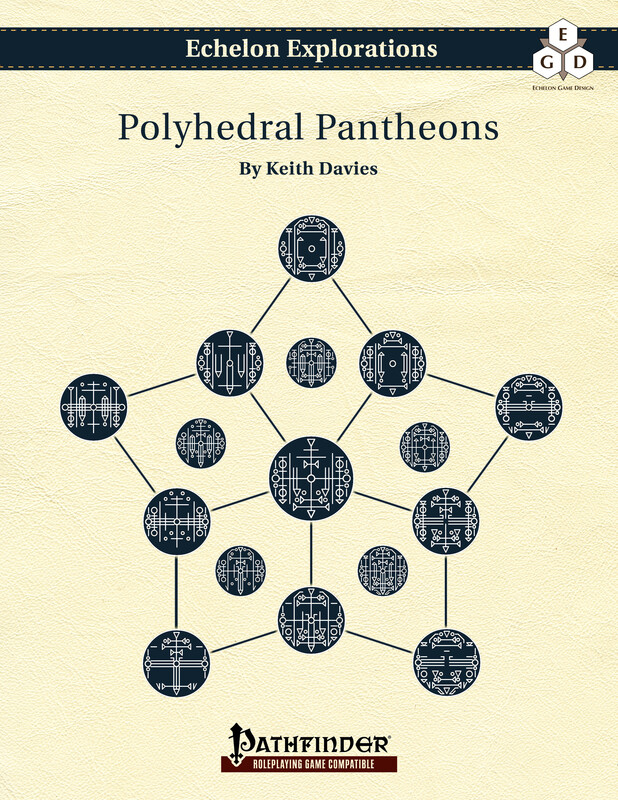 They share a pantheon, and I thought I would use it as an example in my upcoming book Echelon Explorations: Polyhedral Pantheons. 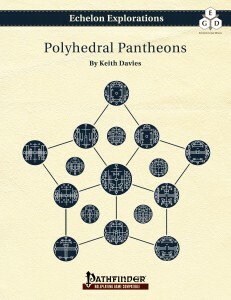 In these articles I will demonstrate how I create and flesh out their pantheon using the guidelines from Polyhedral Pantheons. This article describes the ‘crunchy part’ and covers the game-mechanical stage. The next article will describe the ‘fluffy part’, the world building that happens after. The polyhedral pantheon process can be summarized quite simply. Assign a domain to each point and face. Group domains for each god. Determine the ‘chosen weapon’ of each god. This provides all the information needed to use the gods in play. There is no setting-specific information here, but it is enough for a cleric to choose her god and domains. This pantheon will be split between two ‘cultures’ — despite their shared background, there is a deep divide between the jhesiri and the hilljacks — and I want to have many domains and pairs of domains for clerics to choose from. I’m going with my favorite for this process, the pentagonal trapezohedron, known more commonly as the d10. This gives me twenty-two sites (twelve points and ten faces) to assign domains to and to represent gods. 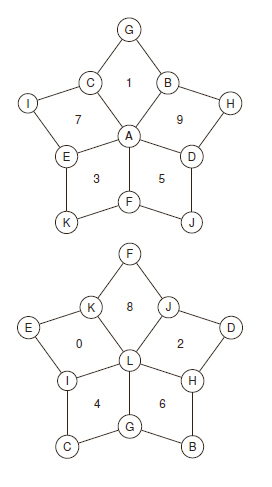 The diagram to the right presents the points (circled letters) and faces (numbered areas) of the polyhedron I am using. I am deliberately placing the domains, choosing which domain will be assigned to each site. I have pretty specific ideas for some of the gods and this method gives me the most control. The jhesiri are a violent, nomadic destructive group of beasties that ranges the countryside and lays waste to whatever they can get away with destroying. The jhesiri distrust or fear magic. The hilljacks are also nomadic, but are much more disciplined and much less destructive, preferring to avoid notice, and while wary of magic do not fear it the same way the jhesiri do. The domain assignments reflect these differences. There is no Good in these gods, nor Healing nor Knowledge. The goblins following this pantheon are not familiar with such gentle concerns. At this point alignment is determined primarily by domain assignment. Each god’s primary domain is in bold text, ‘domain-based’ alignments are (in parentheses). So far this does not look like a very gentle or friendly bunch of gods. Let’s see if it gets better when we look at the point gods (my guess: probably not). Well, I suppose it’s not as bad… but it’s still not a group I’d want to hang around with. I am moving into the world building process next and I don’t need to know chosen weapons yet. I will skip this step for now and wait until I have a better feel for the gods and weapons that will suit their personalities rather than their domains. Total elapsed time is somewhat under an hour, even with writing this post. I have the start of a pantheon that will be split between two disjoint cultures that share a history but not values. As a whole not all domains are included because the culture itself holds values represented by those domains as being of little value (Healing, Knowledge, and Good). In my next post I will start expanding on the minimalist definitions above. What I have so far is almost ready to play (no chosen weapons identified), but I want to know more about them before including them in my setting. Pingback: Halfling Pantheon, the Crunchy Bits | Keith Davies — In My Campaign - Keith's thoughts on RPG design and play. Pingback: Jhesiri Deities of the Goblin Pantheon, Rewritten | Keith Davies — In My Campaign - Keith's thoughts on RPG design and play.